FOUR YEARS AGO I stood on the south strand in Skerries in north Co Dublin. I had undergone surgery for a serious back injury and three months of post-operative rest had left me overweight and lacking motivation. I felt old and weak. In front of me were the inner islands at Skerries and beyond them stood Rockabill, the lighthouse that stands so intriguingly distant on the horizon. As I watched, a lone kayaker weaved around and between the inner islands, catching swell and returning back on his route over and over. I was transfixed. His freedom, dexterity and athleticism were so alien to how I felt, rooted to the sand, that it was like being taunted. I realised then that I had to either follow this stranger to the sea or grow old and fat in an armchair. At first I tried to get out alone. I bought a river kayak and launched from the north strand. I got wet and feared venturing too far from the shore. Then I got some proper training and the sea simply opened up. And what a sea. The Atlantic is wild but the Irish sea, with its roughly carved coastline, rugged islands and wildlife, can be incredible. And there are few places as packed with life and excitement as the islands along north county Dublin. What I’ve started calling the “Skerries triangle” runs from Red Island in Skerries (now attached to the mainland) out past the inner islands of Colt, St Patricks and Shenick, 7km east to Rockabill lighthouse and then south to Lambay, before returning the long way past Rush and Loughshinny to Skerries. In total this is a 32km route that offers open sea crossings, circumnavigations, tidal races and cliff faces. It makes great paddling territory in winter or summer and within and around it all is the fabulous wildlife that make this route their home. 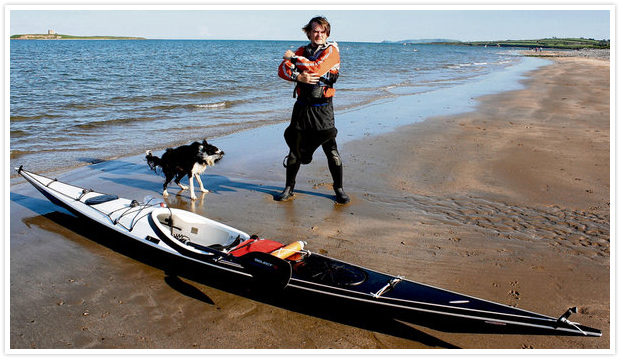 The first time I landed on St Patrick’s island, just a short paddle offshore, I was astounded by what I found. Hundreds of huge cormorant nests, side by side on the eastern side of the island, each crammed with chicks screeching and calling to their parents. Walking to the western side I looked down at the beach where dozens of huge grey seals and their pups lolled lazily in the sun. Wild flowers and sea grass thrived and the ruined church on the headland buzzed with insect life. It was as wild a place as I could imagine, yet I knew, glancing at the horizon, that Rockabill was wilder still. It scared me then, to think of travelling as far as this prominent lighthouse. I managed it the first time as part of my level-three training under a blanket of thick fog – as eerie a paddle as you can imagine – but with fading winter light we didn’t have time to land or rest, so the return leg was hard. Now that I know these waters better (and even though I tell everyone not to go out alone) one of my favourite paddles is to do a solo run out to the Rock and back. I’ve trained for it, bring safety equipment and notify the coast guard or others that I’m going out, but it still requires a lot of exprience. If you ever want to get away from it all though, sit on the heli-pad at Rockabill on your own, with nothing but open sea between you and all of north Dublin. It’s quite a feeling. Rockabill was established as a lighthouse in around 1860 and now has a new global importance. Through careful management this tiny island has become the most important breeding colony for Roseate terns in Europe. Its eco-system is fragile and wardens stay on the island during the summer breeding months and restrict landing but even paddling beneath it is exciting in itself. The sheer number of birds screaming through the air is astounding and all manner of sea life passes by. Lambay Island makes up the third point of this fantastic triangle of islands. It’s a great big lump of rock that is most easily reached out of Rush in north County Dublin but approaching it from Rockabill on the Skerries triangle route is my latest goal – it’s the only part of this route I haven’t completed and it’s all down to our lousy weather this summer. Every time I organised a group of friends to join me on the complete route the wind prevented it. Lambay is a private island and landings are ordinarily not allowed, but a circumnavigation is well worth the paddle. Again, sea birds and seals are a big draw here but so is the island itself, with its high cliffs, troubled waters and history of ship wrecks. Getting around Lambay is no easy feat but well worth the trouble. And while around the back look how close you are to Ireland’s Eye. There’s always something else on the horizon. The White Cottages B&B is in a beautiful spot in Skerries, perched on the coastline looking over the sea towards Rockabill, and its owners Jock and Jackie are sea kayakers too. In addition to the home welcome and great breakfasts, they can put you in touch with training providers, tour guides and boat operators. Tel: 01-8492231. The Skerries triangle is classic trip because it has so much of interest. It’s a mix of diverse islands, tidal flows and wildlife. The duration of the route is also itself a real test of the “inner kayaker”. The sea bird density on the north County Dublin coast is amazing: while the west coast has the beauty and drama it doesn’t pack in the wildlife like north County Dublin. It’s the close proximity that makes the difference. There are few places that have it. The Skerries Islands hold breeding gulls, shags and cormorants, Rockabill is an important Roseate tern breeding colony, Lambay Island has everything else – razorbills, puffins, guillemots and gannets. It’s the second most important sea bird colony in Ireland. This part of the coastline really holds up internationally. Please be sensitive to the breeding sea birds and don’t land anywhere near the breeding colonies. You will see plenty from the kayak all day. The route out of Skerries is around 32km in all. It’s a trip that can give you a real sense of achievement but you need to be fit. Because of its length the conditions will change at some stage, so the challenge is getting the tides right. Ideally you want to head out of Skerries at/around local high water and grab the first of the ebb out towards Rockabill. This should take just under an hour. Ask permission to land at Rockabill from the Birdwatch Ireland wardens. This is really important in late May-June when non-disturbance of the breeding site is a priority for the species protection programme in operation since 1989. After a rest on the Rock you can paddle with the ebb to Lambay, giving yourself another 90 minutes for the crossing. Lambay is a private island and landings are not allowed, but it has a real sense of adventure and feels completely different to everything else nearby. If you’re fit enough you can try the circumnavigation of Lambay or, if not, you come back along the north cliffs and head for home. Ideally you want to hit slack water or when the tides are pushing north again, so that it brings you back to the Skerries islands. It’s a beautiful and demanding day out but pure sea kayaking.